Bora Bora Island lies in the Society Islands of French Polynesia which is a territory of France in the Pacific Ocean. French Polynesia has five groups of islands that consist of 118 islands. 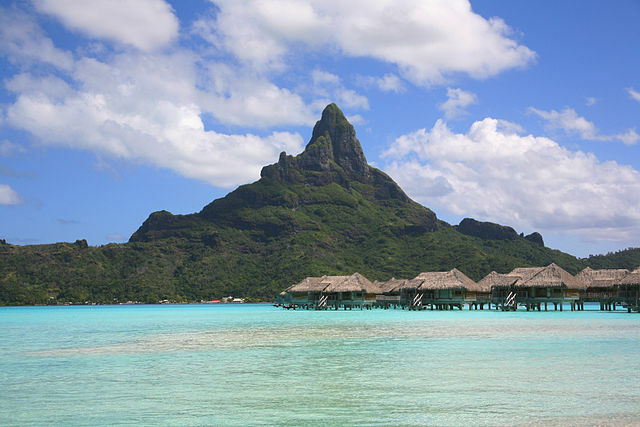 Bora Bora is a small, tropical island that belongs to the Leeward group. It is surrounded by a lagoon and a barrier reef. This island is also home to an extinct volcano at its center. This volcano has two peaks called Mount Pahia and Mount Otemanu. Mount Otemanu is the highest point with an elevation of 727 meters. Bora Bora Island covers a total area of 29.3 square kilometers. It is one of the most secluded islands on the earth. This island has many small islets including Motu Ahuna, Motu Mute, Motu Tapu, Toopuaiti, Motu Tafari etc. The original Polynesian settlers gave this island a name ‘Pora Pora’ which means ‘first born’. The average water temperature of the Bora Bora lagoon is about 28 degrees. The islanders speak two languages French and Polynesian. English is also spoken in the areas frequented by tourists. This island has three small villages, one post office, banks and a variety of small shops. The main form of transport on the island is boats. Bora Bora does not have any dangerous creatures like snakes or spiders. Tourists can enjoy the sublime environment. Declan, Tobin. " Facts for Kids about Bora Bora Island ." Easy Science for Kids, Apr 2019. Web. 26 Apr 2019. < https://easyscienceforkids.com/bora-bora-island/ >.